Accents help "enhance" your already fabulous look. They are shorter than a regular strip lash and are to be used on the outer corners of the eyes for a cat-eyed look. The shorter length is perfect for a natural look with easy, fool-proof application. Accents 301 Lashes (61301) can be worn for every occasion from formal to casually fun nights out. 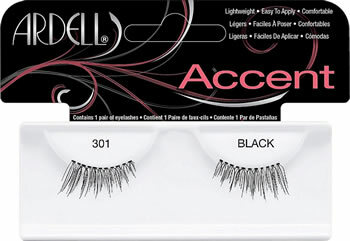 Use Ardell Lash Accents #301 to add just a touch of glamour & sophistication. 1. Start with strip lash adhesive. For the perfect look, apply along the rim of Ardell Lash Accents Pair Style 301, leaving glue to air dry for about 20 seconds to prevent excess adhesive on the skin of the eye. 2. After the adhesive becomes tacky, next gently align your #301 lashes direct on top of your lashline to cover your natural lashes. To achieve a non-clumpy finish, press gently. I've been looking for a natural-looking way to play up my eyes. I didn't want to get contact lenses because I like my brown eyes, so I decided to look into false eyelashes. The first few I tried looked to dramatic, fake and silly on me even though they were deemed as natural. But these accents are perfect! They look natural, are the perfect size, are petite, flirty and are really pretty. I got many compliments on my eyes. Only drawbacks are I don't like the glue it comes with because it gets loose after a few hours, so I purchased DUO Dark adhesive which worked a lot better. Also I apply mascara over them so they blend in with my real lashes better and they were kind of hard to clean. Either way I love them! I am an licensed cosmetologist and esthetician. False lashes goes with the beauty industry in general. I like how these half lashes are different than the rest. I just bought these on a whim last week & I am so sorry they were not available way sooner. It gives me such a dramatic yet natural look in about 1 easy minute using the dark adhesive. I am hooked! (I had only used the individual lashes before, so I am pretty much a false eyelash virgin.) Thanks Ardell for making such an awesome product. I have been a full strip eyelash wearer for years now and when I saw the half eyelashes I wanted to try them. I am hooked. They are so natural looking that I can wear them everyday to my conservative job guilt free. I have a hard time putting on strip lashes and they usually look to dramatic on me. I love the cat eye lashes because its not over the top but you still get a little bling!! I can wear these to work and not look like Im going to the club!! haha..People thought these were my lashes and they were very easy to apply. These would of been 10 stars if I could get more than 2 good uses out of them. I use liquid liner to do a wingtip as well. Somewhat hard to clean but not a bad thing. Love this!!! Going to try the 305's now.